Is this photo of the OnePlus OneWatch site legit? Update: A OnePlus spokesperson informed us they have nothing to add at this time. Apparently regretting nothing about its choice of naming schemes, OnePlus is reportedly preparing to release the OneWatch smartwatch. The OneWatch will supposedly follow in the footsteps of the OnePlus One, a budget-priced high-end smartphone that's currently making waves in the industry. 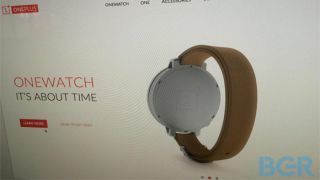 OnePlus is already close to launching the OneWatch, according to BGR India, though this is the first we've heard of it. The site received a sketch that shows a smartwatch with a round face and supposedly set to feature a sapphire OLED display, titanium trim, and a curved, wireless-chargeable battery tucked inside a leather strap. OnePlus isn't the only tech company that likes to use "One" in its names, but luckily HTC's rumored smartwatch is by all reports going to be called the HTC One Wear. That's different enough, right? And another difference between the OneWatch and other smartwatches could be the OS, if OnePlus decides to go with its own Android variant rather than the Android Wear OS that the likes of Samsung and LG are choosing at the moment. Either way, BGR also received a shot of a OnePlus OneWatch website page, indicating the watch's launch could indeed be close. Now we'll just have to wait for OnePlus to announce the OneWatch officially - and to see whether they stick with the same invite-only buying scheme they've used for the OnePlus One smartphone. On the other hand, these images came from an anonymous tipster, so they could be altogether BS. We've contacted OnePlus just in case, and we'll update here if we hear back. Is this our first look at HTC's Android Wear-based smartwatch?